A few years back, we spotted a Death Star made entirely from ginger snap cookies, and while that one looked crunchy and delicious, I think this one is even more impressive because of its construction technique using flat sheets of gingerbread. I’m guessing they used a beach ball or something round inside to provide the initial structure. 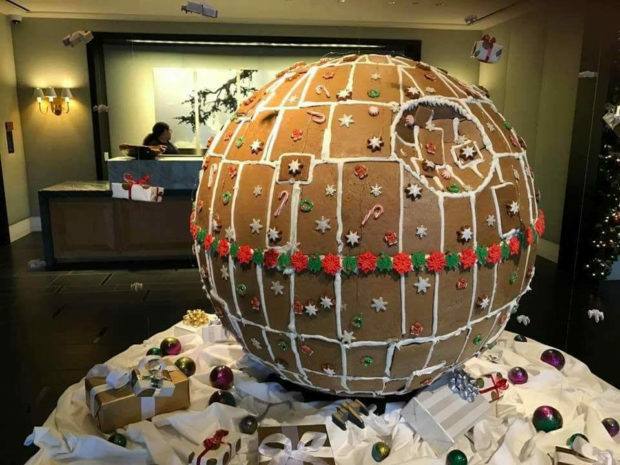 I’m not sure what office this gingerbread Death Star is located in, or who made it, but the person who posted it on imgur says that it’s “fully operational,” so gingerbread Alderaan is toast. I wonder if this one’s weapon is powered by Kyber crystals, or if it simply fires frosting at its target.